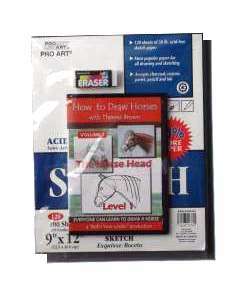 NOW EVERYONE CAN DRAW HORSES! Celebrate the right side of your brain! You know, the creative one? Shake off cobwebs and get your kids, grandkids (or you) off the video games and away from mind-numbing TV shows. Get back to the satisfaction of creating artwork utililizing only the artist's basic tools of just a pencil , eraser and sketch pad! <>If you can draw circles, lines and triangles, you can learn to draw not just a horse , but virtually anything! 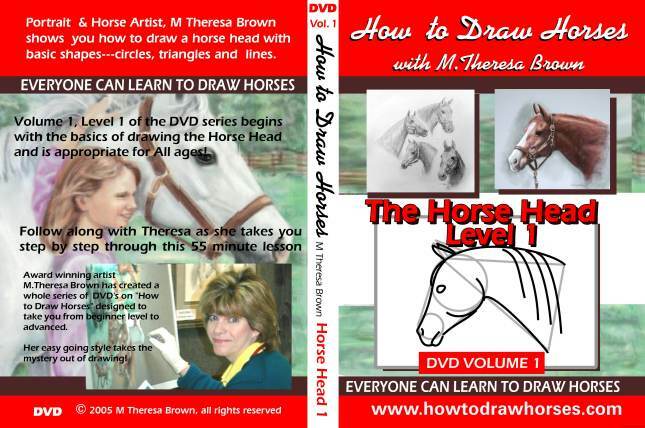 The joy of this Level 1, 55 minute DVD is that you can stop it or pause and still follow along with Theresa while she takes you through a step by step process of creating a good basic line drawings of horse's heads. She will show you how you can also use Breyer or Peter Stone models. You will learn the basics of blocking out the head in several different angles, creating detailed ears, eyes and noses & creating tack. <> This first DVD is for all ages. 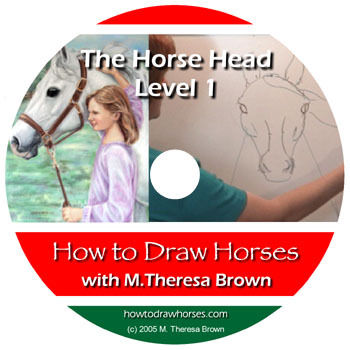 You are preparing the way for more advanced techniques in Theresa's upcoming DVD's on drawing the body of the horse, shading, working in various mediums and working 3 dimensionally. Wonderful artist, the DVD is VERY informative, I will be back! Love the DVD! Thanks! My daughter is thrilled! My daughter LOVES your DVD! When she caught on about the basic shapes, it took off! Then I sat down with her and I impressed myself. It's great fun! Where's the next one? Pick up your sketch pad and pencil and get back to basics! Learn to draw horses with Award winning Equine and portrait artist, M. Theresa Brown! Theresa has been creating fine art portraits in oils, pastels and watercolors for 20 years. An illustrator, author and art instructor, she has illustrated books for several New York publishers such as Breakthrough Publication and Houghton Mifflin. A member of the Equine Art Guild and the American Society of Portrait Artists, she brings her drawing expertise to a series of “How to Draw Horses” DVD’s and seminars. Theresa has been involved with a diverse array of horses and disciplines since childhood. She grew up with Connemara ponies, Arabians, 4-H and Pony Club before moving into Thoroughbreds, dressage and cross country. She spent a summer in the gaited horse world, later owned several teams of Belgian draft horses and took to the mountain trails with her Quarter horses. Adding to Theresa’s knowledge of animals is her 15 years as a professional dog show handler! Her hands on knowledge of horses and her ability to beautifully capture both people and animals in her portraits make Theresa a sought after portrait artist in the world of horses! 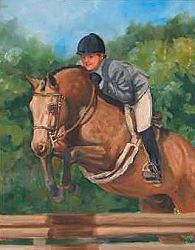 When not traveling to horse shows, equine expos, juried art shows and clients’ homes across the country, Theresa and her artist husband, Stephen Filarsky can be found in their studio outside of Wake Forest, N.C.
To learn more about her artwork, visit www.portraitsnc.com. To learn more of her DVD’s and upcoming seminars, visit www.howtodrawhorses.com. And to go directly to the horses, visit www.classicequineportraits.com. She can be reached at her studio at 919-880-7431 or by email at ipaintportraits@aol.com. Volume 1, Level 1 of the series begins with drawing the Horse Head and is appropriate for All ages! The drawing kit is very popular as a gift set and at horse shows or Equine expos where the kids especially, run back to their RV's or horse trailers, watch the DVD, practice on the supplied drawing pad and return to Theresa with their creations! Their enthusiasm is SO contageous! And it takes them away from the "point and click" mentality which is stifling the creativity level of today's young adults. It is also amazing how many Grandparents buy the kit themselves and keep the drawing tools and eventually give the DVD to their grandchildren.